Bibimbap is a staple in the Korean diet. Its literal translation in mixed (bibim) rice (bap). Invariably, there there are an infinite way to create and serve the dish. Nonetheless, traditional truly Korean bibimbap is made up of rice, an egg, an assortment of fresh and fermented vegetables, red chili paste (gochujang), and often meat. Foreigners often liken bibimbap to a burrito bowl. The rice dish has always been prevalent in Korea, but has now become a popular dish all around the world in part thanks to South Korea’s increasing diaspora and highly celebrated pop culture. Inevitably, with the dish’s popularity has also risen a curiosity around bibimbap’s history and culture. The peninsula’s geographical makeup meant that different regions of Korea adopted different types of proteins. To the west and south in the coastal regions it was fish; Inland and the north focused on beef, pork, and chicken. However, Korea’s mountainous terrain meant that forest and root vegetables (in their many variations) were aplenty and an integral aspect in all regional cuisine. The precise origin of bibimbap is difficult to discern, but scholars have several speculations. The first of these theories is that the practice of mixing vegetables and rice together came from the practice of jesa ritual rites. This theory argues that people mixed rice (bap) and the vegetable and meat side dishes (banchan) together in a single bowl for ancestral food offerings, before eating it themselves. Another popular theory is that in an attempt to start the new year afresh, households would mix all of their leftovers with rice. This theory seems highly plausible as many people now make bibimbap at the end of the week when there are only leftovers in the fridge. That being said, understanding that Korea has historically had strict meal rituals, it is equally as likely that bibimbap’s true origins stem from ritualistic practices. In fact, bibimbap was first recorded in a history book by a scholar in the Joseon Dynasty sometime between the late 1500s and mid 1600s. Since then it has been referenced or described in multiple published works. From scholarly work to encyclopedias to recipe books, these varied texts illustrate the widespread prevalence and impact bibimbap had all around the Korean peninsula. Bibimbap became a widespread phenomenon for several reasons. Perhaps the most obvious reason is because of relative ease required to make the dish. 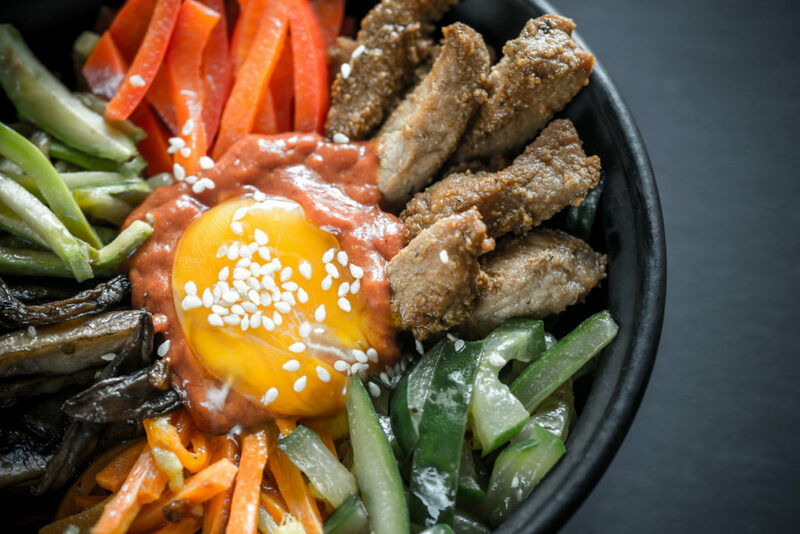 While more traditional variations of bibimbap may require more elaborate preparation (the seasoning of vegetables, cooking of meat, and heating of the stone bowl) there are much more paired-down versions that are widely popular at home and in restaurants. 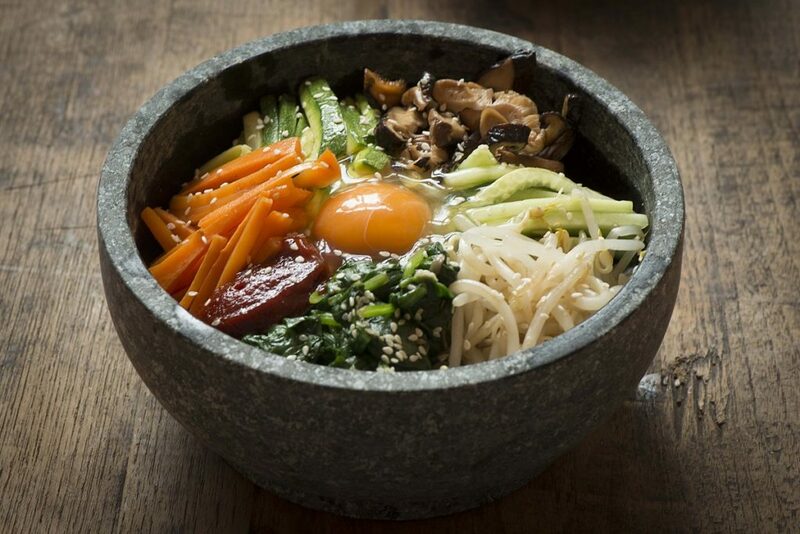 From egg, rice, soy-sauce, and sesame-oil to eggplant, quail eggs, and raw fish, the variants of bibimbap are endless. Indeed, as mentioned before different regions are famous for different interpretations of the popular dish based on their access to different proteins and ingredients. The dish has also been popularized because of increased travel to Korea and an increase in general awareness of the country. Dominant airlines, such as KoreanAir, now serve bibimbap as a staple on their long-haul flights, introducing the dish to people who may merely be on the plane to connect to a different country. That being said, the wave of Korean popular culture that swept the world in the early 2000s has certainly played a role in the popularization of bibimbap and other Korean dishes in general. People have garnered an interest in Korean food through watching Korean dramas, reality tv-shows, and music. Korean culture earning a name for itself has, in turn, encouraged entrepreneurs and business owners to capitalize on growing interest by opening Korean restaurants, food trucks, and food stalls. All of these places are likely to serve bibimbap, only increasing people’s interest in the relatively cheap, healthy, and delicious rice dish. Bibimbap’s history and culture is one of great interest and alludes to the greater cultural impact that Korea continues to witness today. Because of its diverse nature, anyone who visits Korea should make an effort to try it in its many different forms, finding out for themselves which regional bibimbap they like the most!